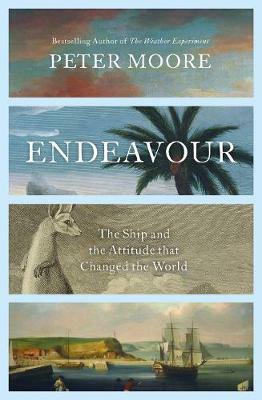 From Johnson to Burke, a cast of 18th-century greats peoples Peter Moore’s informed and infectiously enthusiastic history of the legendary vessel Endeavour. A bow-side view of a century in motion. An inventive biography of one of the most famous ships of all time - from the oak tree it was made from to its last voyage in the American War of Independence. The Enlightenment was an age of endeavours. From Johnson's Dictionary to campaigns for liberty to schemes for measuring the dimensions of the solar system, Britain was consumed by the impulse for grand projects, undertaken at speed. 'Endeavour' was also the name given to a Whitby collier bought by the Royal Navy in 1768 for an expedition to the South Seas. A commonplace, coal-carrying vessel, no one could have guessed that Endeavour would go on to become the most significant ship in the history of British exploration. Endeavour famously carried James Cook on his first great voyage, visiting Pacific islands unknown to European geography, charting for the first time New Zealand and the eastern coast of Australia and almost foundering on the Great Barrier Reef. But Endeavour was a ship with many lives. She was there at the Wilkes Riots in London in 1768. During the battles for control of New York in 1776 she witnessed the bloody birth of the United States of America. As well as carrying botanists, a Polynesian priest and the remains of the first kangaroo to arrive in Britain, she transported Newcastle coal and Hessian soldiers. According to Charles Darwin, she helped Cook add a hemisphere to the civilised world. NASA named a space shuttle after her. To others she would be a toxic symbol, responsible for the dispossession of the oldest continuous human society and the disruption of many others.